According to the former Crown Prince Paras of Nepal, he would still like to be involved in politics and his father, the deposed King Gyanendra, is working for the restoration of the monarchy and a return to his throne. I can only hope that this is true. How many times have we seen exiled royals adjust to their comfortable lives as minor celebrities and make no real effort to restore their thrones? It might make some difference since the Nepali Royal Family was chased out such a relatively short time ago, but it is still good to see that they trying to remain in the public view and working to set right all that has gone terribly wrong in their country. There are some problems though. Crown Prince Paras, from what I have heard, was never all that well respected an individual (I may be wrong -hope I am) and he does not live in Nepal, he lives in Singapore and has for some time. He also spoke of wanting to form his own political party. Let me state for the record that I am for royals getting back into government and am not particularly concerned with the path they take to accomplish this. However, princes forming political parties tends to make me a little uncomfortable. Confucius I think once said that a gentleman should have nothing to do with political parties and despite all the momentary press coverage the former Czar of Bulgaria, Simeon II, being elected Prime Minister as leader of his own party did not bring about a restoration of the monarchy. It seems to me that going the route of the political party will only make the royal in question a more divisive figure. Nepal has been one the ground-zero areas for monarchy in our time. It was a loss to the history and culture of the world when the last Hindu monarchy was abolished thanks to an on-going war against communist guerillas. As usual, the communists did not exactly take over on their own, but were able to manipulate "moderates" in order to get their own way. King Gynanendra deserves everyone's respect for the awesome problems he has had to deal with as monarch. He came to the throne in 2001 (I remember sending out a special report for the RPA) after the former Crown Prince Dipendra massacred the Royal Family before taking his own life. 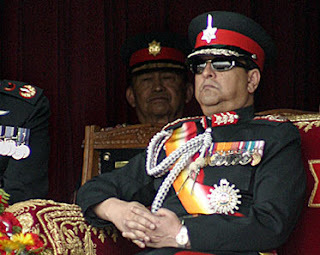 The country was stunned, shaken, had lost a dearly beloved monarch and suddenly King Gyanendra was on the throne of a country in turmoil, unknown and mistrusted by many, forced to deal with Maoist revolutionaries and entrusted with securing the Shah dynasty. Regardless of what the outcome has been thus far, I give King Gyanendra credit for not simply giving up and running away to live the good life. I would also add that the Himalayan region is one where monarchy and traditional authority has been under the most direct attack in recent decades, perhaps because their isolation meant that they were some of the last places on earth to be touched by the liberal revolutionaries. The Dalai Lama was forced out of Tibet 50 years ago this last week, the King of Bhutan has begun to introduce democracy into his country out of a misguided sense of modern benevolence (if it ain't broke don't fix it) and then we had the bloodbath in Nepal and the overthrow of the monarchy by communist revolutionaries. The west has ignored all of these dangers, God knows why, but in the future events may become too critical to ignore. I wish there was an international monarchist brigade to go fight for the King of Napal -Spanish Civil War style - but I know that will not happen. The former US administration did virtually nothing about it and when it comes to opposing the spread of communism I cannot imagine the current administration doing anything considering how they have, in their first months in power, assured China that no amount of cruelty on their part will damage our friendship with them (and their cheap labor), cast doubts on whether North Korea even has a nuclear program and have hinted at making nice with Castro's Cuba. So far, the current US administration seems to be snubbing our oldest monarchist ally and cuddling up to the communists of the world.